Good sauger bite if you want action and to practice different techniques. Lots of shorts with some better fish mixed in. Cranks on three way keep us busy setting lines and reeling in fish. Last edited by Mike V on 07:01am - Apr 14,19, edited 1 time in total. Location: Not quite over the hill, but has a breathtaking view from the lofty perch. thanks for the report Mike. Are they spawned out yet? If a man can't laugh at himself, He leaves the job to others. I’m not sure about the spawn progress. The fish today were all males. As far as they were concerned, the spawn was still going on. I'm going to try tomorrow the water was still good today but I want to have Lasalle lake as a backup.I called the number from their internet site and the message said open daily from sunup to sundown. Buster just called me from his car he checked the vermillion on the way home and it's all muddied up after being clean this morning.I assume the main river will be the same by morning so I'll golf tomorrow and do Lasalle weds. Nice job Mike - its always fun to get into that fast action, guess I should have known high water=move upstream. Water came up faster and higher than I thought it would. Was going to go walleye fishing tonight but guess will put that on hold as the launch will probably be closed. Good call on the wait. I bet this weekend (Saturday) would good unless the rain coming in changes predictions. 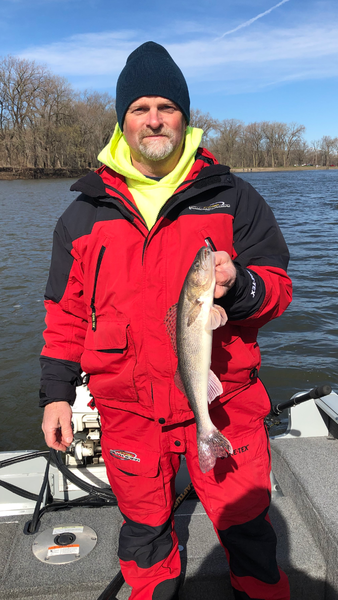 We picked up 15 sauger on the first pass. Made a half pass caught 5 more and called it a day. That's some good fishing Mike,makes me want to try cranks in the future. When the crank bite is good there is a lot of action. Covering water and active fish keeps you busy. At times, I can’t get a fish to bite cranks but when they do like now, it’s a ton of action. Chitown-Angler was started on February 10, 2003 and has received 207678485 page views in total since that date.